The trend of convergence of networks and services, as well as integration of applications with IP protocol have caused significant growth in the significance of network infrastructure for the purpose of optimal transmission of various types of data. Convergent network infrastructure should today support simultaneous transmission of critical business applications (e.g. transaction database systems, data repositories, e-mail), interactive data transmission (unified messages, IP telephony, video and video conferences), as well as transmissions of large quantities of backup data. 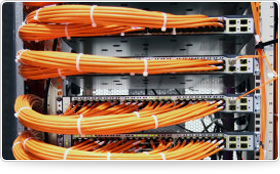 Design, implementation and maintenance of network infrastructure is undoubtedly a great business and technological challenge for every organization. Ensuring optimal transmission, stability and system development opportunities with minimum financial expenses is the key to success. NetContractor consultants will help to preserve business– technical balance when developing the foundation of your company. You are welcome to cooperate with us.